As a professional diver goes out in a bid to capture fish, players too will have their eye on treasure that can be as big as 7,500 times the bet in a 27-ways pay, low volatility game. With 3D blue marlins, spiky puffer fish, oysters with pearls and other fish and plants, players will want to stay under the sea as long as their tank has oxygen in it. As for sharks, they represent wild symbols and when players have three stacked in the middle reel, they will get a free respin. And only in that free re-spin will they see the treasure chest symbol. 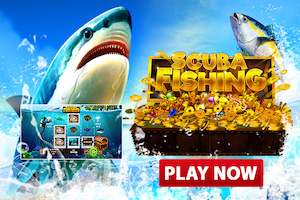 Players can watch as the shark smiles for the camera in his photo, while attempting to capture all of the riches of the sea, from fauna to flora to a fortune.